DiRT Rally is hard work. It is also quite different from the most recent games in this popular racing series. DiRT Showdown was a destructive and colorful spinoff for the franchise, but it stumbled with technical implementation and depth. Before that, DiRT 3 delivered a slick combination of racing, rally and trick-based gymkhana that offered superb value and high accessibility. Now, with DiRT Rally, the focus is almost singular as the series takes an abrupt turn into simulation territory. Unlike the previous games, destruction is something you’ll strive to avoid and strain a few muscles in the process. DiRT Rally is the ultimate test of endurance across brutal tracks from around the world with varied cars from different eras. DiRT Rally was actually released first via Early Access in April of 2015. Few could blame Codemasters for testing this community-involved development process when every survival game, from A to DayZ, has been using it for years. It gave Codemasters the opportunity to assess the viability of a simulation title and refine it based on player feedback. The time was put to good use from a technical perspective, with sizable updates and a final product that is largely free of issues. Courses and even modes were released steadily during development, along with tweaks and fixes. The Early Access route worked fairly well for DiRT Rally after only eight months in the program. As expected, the majority of content revolves around the Rally discipline—single direction courses with a navigating co-driver. Players can race single events, but the career has a progression system (cars and credits) so it will likely be more popular. 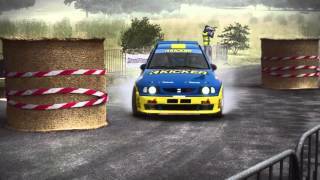 The career mode consists of long Rally championships of varying difficulties. Players can enter these with owned vehicles that are grouped into eras or types. Each championship is comprised of stages set in a particular location, like Wales or Germany. Performing well will see you earn funds to purchase more cars and also unlock harder championships. Underperform, or accidentally skip events, and championships will need to be repeated to access these harder tiers. Progress can be slow because money might be funnelled through virtual engineers that help repair your vehicle after it suffers one of the many embarrassing accidents. Luckily, custom events are a good way to build funds without the endurance required for championships. You goal in either case is to beat the times set by simulated drivers—there are no other vehicles on the tracks. It won’t be long before it becomes clear that DiRT Rally emphasizes car handling, track design and driver endurance. The number of cars in DiRT Rally is not impressive, just a handful in each group, but their variation provides excellent value. The cars in different eras are quite unlike others from another group. These different groups can almost be considered difficulty options, and thus caution is advised when buying modern cars with the limited funding provided during the career. Older vehicles are slower and have harder suspension, while modern rally cars are fast and have insane braking abilities. Switching rapidly through these groups might affect consistency—it can feel like playing a different game. There are vehicle assists that keep you on the track, but they hinder course times. Driving each car will progressively unlock performance upgrades and enable advanced tweaking options. Tweaking suspension, gear ratios, wheel camber, brake bias and more can make a huge difference to handling. It might alter a car from sliding gracefully around corners to flying off a cliff because of understeer. These vehicle tweaks can be used to match a personal driving style, mitigate vehicle differences or be adjusted to suit the conditions. You can ignore them and still drive well, or download tweaks other players have created. Although vehicle control is vital, the tracks are the ultimate challenge. From the dirt roads in Greece to the icy asphalt in Monte Carlo, the tracks are consistently brutal. Their design is not just hard because of their slip ‘n slide surfaces, but because of tight corners, cliffs and bumps that lead to accidents if they are taken at the wrong speed or angle. The placement of rocks and crests near corners is definitely not friendly for new players. The snow roads in Sweden are narrow and steering into the powder can slow, turn or flip your vehicle. Likewise, the roadside ditches in Finland can hold your vehicle hostage as you jostle to freedom without overcorrecting into the opposite ditch. Every corner is a battle. Every crest is a reminder of how easy it is to lose control and fly into a tree. The fight is not without reward, as it becomes easy to carve seconds off split times and begin seeing green times that indicate you are beating the simulated opponents. With such difficult tracks, just making perfect corners offers satisfaction that most racing games never achieve. Sweden at night, in the snow. It's tough. The Rally tracks themselves are long and unidirectional, so the co-driver becomes vital when beginning your career. The turning calls are not always perfect, and they barely adjust for track camber or the distance between turns. Like most racing games, learning the routes will vastly improve course times. Also, tracks share crossroads, so there is familiarity which can minimize the reliance on the navigator. The career championships force you to complete courses in the reverse direction, although this means they drag on. It is disappointing that you cannot drive select routes under set conditions during the career. Instead, the stages and weather conditions are randomized to force reliance on the co-driver and prevent drivers from abusing the championship series. Eventually players will learn the routes anyway, so why artificially limit their control of the experience? Brutality is the answer; DiRT Rally is one of the toughest racing games you will play from Codemasters. Flawless runs are often required and there is no rewind feature this time. In championships, repeated perfection over numerous tracks in differing conditions is the only way to progress. Restarting events is always possible in the career, although it reduces credit reward and still requires the completion of the entire course in one attempt. There is a “shakedown” practice, where you can completely smash your car just to learn the first segment and/or experiment with vehicle tweaks. Satisfactory course runs, with perhaps one or two minor spinouts, might be good enough to unlock harder championship series. Beating the top AI driver requires concentration and skill that is possessed by only a precious few. There is no easy mode—the track design and car handling would make this impossible unless the game physically took control. A rewind (flashback) feature would make things easier, but it would compromise the entire concept of a single continuous, flawless run. Rally driving is about endurance and this is adequately represented during the career. Events can be 5-10 minutes long and car damage is retained over multiple stages. Endurance arises from putting in good times and not destroying your vehicle in the process. Being aggressive, aiming for the best time, can be detrimental in the long run. Eventually brakes will start to grind bare metal, cracked windscreens can obscure corners and a flat tire will introduce random deviations that make cornering much harder. Smash your car enough and the repercussions will cascade into subsequent events. Even the navigator will take notice of your leaking radiator. It might be wise to take an easy corner and keep your vehicle in pristine working order, rather than repair it during a race. A punctured tire will incur a 90 second penalty. Resetting a vehicle back on track, after getting stuck in the snow, will cost around 15 seconds. Also, bizarrely, driving off a cliff only incurs a similar 15 second penalty. This is because the game teleports you back to the track, preventing some truly glorious crashes. Another case of leniency occurs after flipping or rolling a vehicle; the game usually finds a way to reset the vehicle back upright so you can continue. With all these penalties, losing concentration for just a second is a big deal. DiRT Rally successfully taps into the endurance aspect of Rally driving and it will regularly test your perseverance. There are two other modes in DiRT Rally—Hillclimb and Rallycross—although they are both insubstantial in comparison to Rally driving. Hillclimb is just driving fast cars up a gradual incline around sweeping bends with good visibility. There is no co-driver, so it is fortunate that you get two chances and infinite practices. It is a good option to earn credits through consistency because there is just one long track for the entire mode. This track does have different surfaces, gravel or asphalt, but it will not take long to learn. Hillclimb is further restricted by limiting vehicle choice to just a few expensive cars; an unfortunate decision given the quality of the track and its potential with other vehicles. Rallycross is the third mode available and it offers basic circuit racing that was more prominent in the previous DiRT games. Much like Hillclimb, it lacks content, with just three short tracks that have bland alternate routes. Rallycross does have opponents on tracks and allows drivers to crash directly into them with no penalty, but cutting corners is punished. The basic tracks have only one new trick—a “joker” route which must be taken once per race and keeps cars adequately separated. But the mode suffers the same problem as Hillclimb—restricted to just few specific vehicles. Both of these modes feel unfinished and too isolated from the rest of the game. Their limited content raises serious questions about why they were included in the first place. And this is why it is bizarre that the only competitive multiplayer involves the aforementioned Rallycross mode. Want to compete in Rallies against other drivers in real-time? Sorry, not possible. This is perplexing given the feature existed in DiRT 3 and worked so well with both ghost cars and staggered starts. So the most insubstantial filler-mode, Rallycross, is the only recourse for competitive driving. Persisting with this poor excuse for an online mode exposes several additional problems. Firstly, the wait times between races are unforgivable. Drivers may wait two minutes for a race that is barely three minutes long. But there is a much bigger concern—vehicle upgrades. Upgrades obtained from merely driving vehicles are functional during competitive races. And upgrades make cars significantly faster, most noticeable along straights. This is horrible; they do not belong in the competitive arena. The better driver should win out, not the one who has driven their selected vehicle the most. If you buy an expensive Rallycross vehicle, then you must spend hours driving it just to compete. It is reason enough to avoid the competitive multiplayer entirely. Fortunately there is a good element to the online portion that comes from daily, weekly and monthly events. These online events are completed alone, but you are ranked against other drivers across the world. Rewards are granted based on relative performance against other human drivers. These online events can only be driven once, sometimes without practices. Wager events up the ante by allowing drivers to bet on their performance. Competing in online events can take precedence over the career because of the variety and reward. The daily online events are quick too, and it is a pity there are not more of them. Powered by the reliable EGO engine, DiRT Rally generally looks good across its various locations. Tracks vary from muddy forests to icy cliff-side roads. It has several different weather conditions, depending on location, ranging from fog to snow. The time of day also changes from morning to night. Mix them together and you experience a blizzard during a night stage, adding appreciable difficulty compared to a clear sunny day. Smashing your front lights will raise the challenge further. DIRT Rally is packed with many subtle graphical features too, like the rain droplets on the driver-side window reacting to the car speed, or trackside lights dissipating through the dust stirred up on a night stage. Because the tracks are so long, there are some graphical weak spots. Foliage can look flat and the snow courses lack the distinction seen in other stages. Overall, DiRT Rally looks good and has excellent performance which is vital in a game where precision is key. DiRT Rally is not for the faint of heart. Previous enjoyment of the series is not indicative to how much satisfaction you'll find here. Closer to a simulation than an arcade experience and precise in nature, it could be a tough sell for some DiRT fans. If you enjoy Rally driving, then all you need is patience and unwavering concentration. Difficult tracks, cars that are hard to master and an emphasis on endurance are all part of the reason why DiRT Rally is a great entry in the franchise. Drivers will be pushed to their limits both physically and mentally. 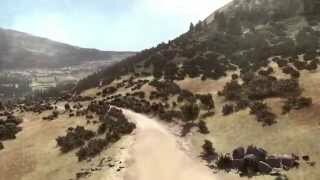 It includes a decent number of Rally tracks in different settings that require many hours to master. Same can be said for the vehicles, which handle superbly. Unfortunately the supporting content is fairly shallow, with the Hillclimb and Rallycross modes struggling to justify their inclusion. There is no online rally competition either, with Rallycross being a poor and flawed substitute. Pay no mind though, because as the name implies this game lives and breathes Rally driving. It builds immense satisfaction as you make corners with precision and promotes consistency as you finish events without a scratch. DiRT Rally is hard work, and there is nothing wrong with that. Looks good on most tracks, with many subtle details. Foliage is a bit flat and spectators are low-polygon. Awesome driving controls without assists. It can be frustrating until mastered because of the brutal track design. Broad vehicle handling models provide a lot of value. The championships test endurance and thus tend to drag. Custom events are a great option though and plenty of rally tracks. Difficulty is high with adequate rewards. Competitive mode via Rallycross is poor and shallow. Online events and leaderboards are great though. Produces high framerates at ultra settings. Tracks also load fairly quickly. DiRT Rally carefully simulates the endurance of rally and offers a brutal driving experience that builds satisfaction through vehicle and track mastery. "Hairpin left into a good new direction for the series"
DiRT Rally is ranked #507 out of 1434 total reviewed games. It is ranked #35 out of 110 games reviewed in 2015.